Posted on November 24, 2018 in"& More!" Today’s post is a little different. This is where the “& More!” part of the site comes in. 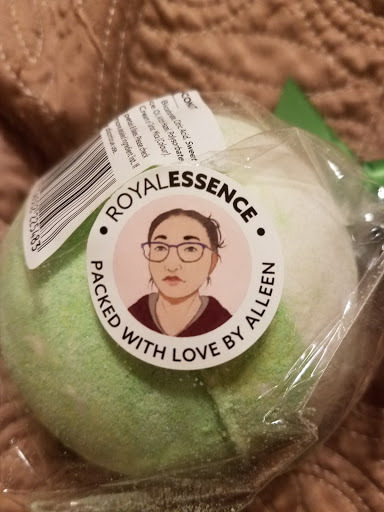 It IS a review but not of anything book related: It is a review of some of Royal Essence’s bath products! If you have been following me on Instagram at all, you know I am a bit of a bath snob and love my bath bombs and bath related products! I’ve been ‘mini-reviewing’ them on Instagram as I use them, and today I am featuring one of those companies! 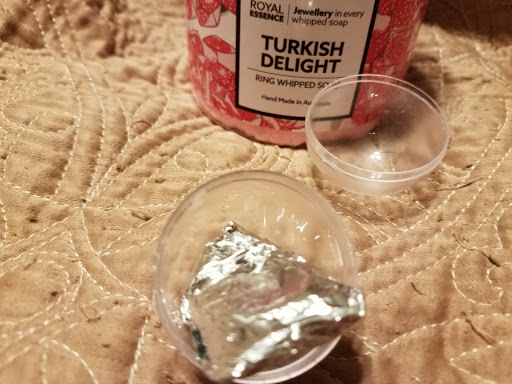 I found out about Royal Essence via an ad on Facebook and decided to give them a try. They are located in Adelaide, South Australia and the products are hand made and personally packaged! You can also tell from the products themselves that they are not mass produced. There are three kinds of jewelry you can order in their products: rings, earrings, necklaces. 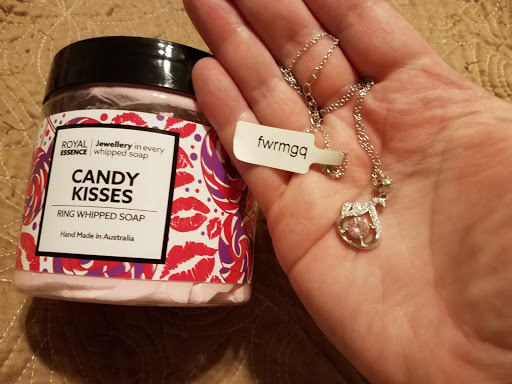 For a short time they had “essential bath bombs” which came jewelry free and cost less than the bath bombs with the jewelry. All of their jewels are guaranteed 925 sterling silver with semi precious stones or man made crystals. Each jewel has a minimum RRP (Recommended Retail Price)* of $90 (Australian dollars). * RRP is an approximate value of how much your jewel could sell in a jewelry store in Australia. 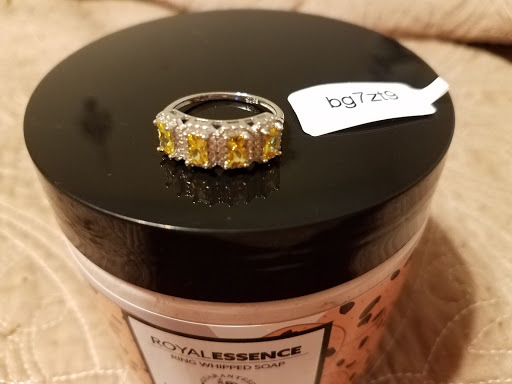 Every purchase of a Royal Essence product gives you a chance to win a jewel worth up to $5000 made with 14 or 18 Carat White/Yellow/Rose Gold with natural gemstones and conflict free diamonds. For me it is NOT about the jewelry, it is about the product. The rings are a nice bonus. 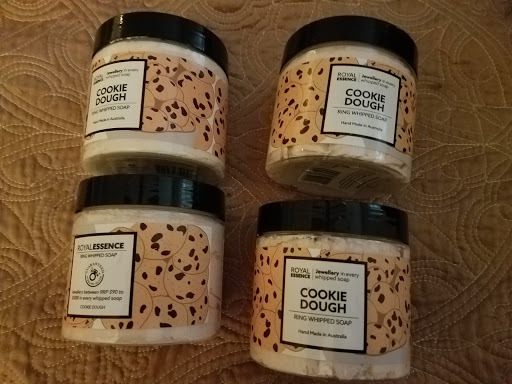 I will buy the product if I like it and I found a product I love: the Cookie Dough Whipped Soap! At first I was not sure of the scent but it slowly grew on me. There are even some real chocolate chips at the top of the soap. The soap really is whipped and I LOVE the texture! Sadly, they discontinued the chocolate chip cookie dough whipped soap. When I found that out I ordered several of the soaps, not caring about the ring size. I loved the soap and had to stock up! Packaging: 5 stars These items arrived VERY well packaged! Again, they come from the other side of the world: Australia! I was pleasantly surprised with the packing with my first order. Great care was apparently taken with my order to ensure the products arrived safely! 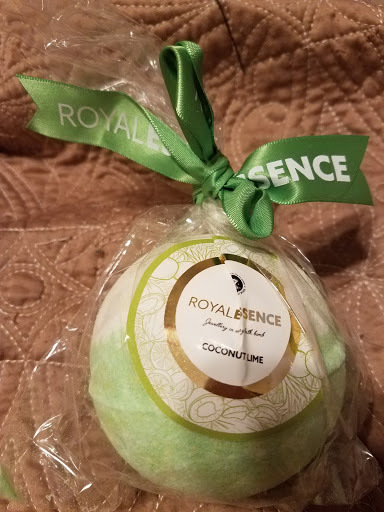 Bravo Royal Essence! Shipping Time: 5 stars I was thinking it would take at least three weeks to a month for my orders to arrive. I was pleasantly surprised that each time I have ordered my packages arrived in as little as 1.5- 2 weeks! One time I had to go to the post office to pick up my package and sign for it, the other times it arrived on my doorstep. Cost: 4 stars The products can be a little costly, but remember you are getting the product and a pretty piece of jewelry! 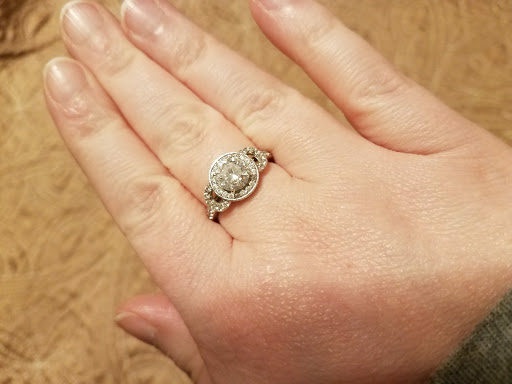 Part of the magic is finding out what your pretty jewelry item looks like! You can also enter the code online to find out what the value of the item is. It seems like their is no free shipping to the USA, but the shipping hasn’t been bad, if memory serves, it was just around $8.00 (which was why I expected a long arrival time). 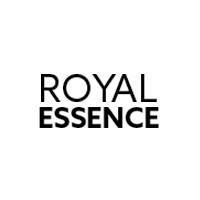 Products: 5 stars I have ordered from Royal Essence four times! I have ordered the bath bombs, essential bath bombs and the whipped soaps. The whipped soaps are my favorite by far. It is a texture thing and I LOVE it! Maybe at some point I will buy a candle to try, but not yet. I have enjoyed all of the products I bought! 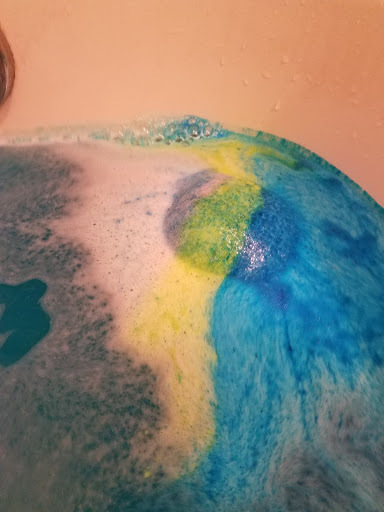 and the bath bombs are huge! 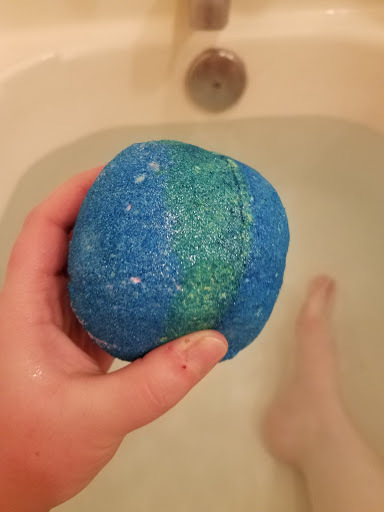 The one pictured below was an essential bath bomb( no jewelry inside) and it was so large it could have been used for two baths! 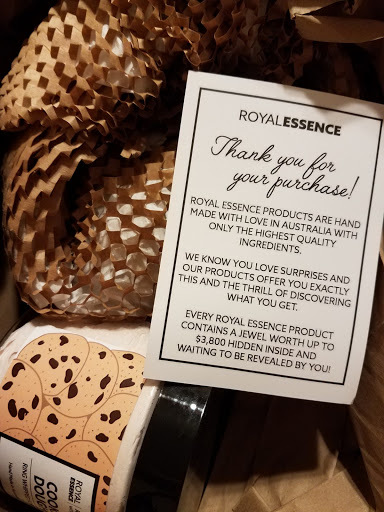 Giveaways: (not rating) Royal Essence seems to have giveaways/sales a lot and free items shipped on orders- but only if you are in Australia. I wish I could participate, but I understand: I am on the other side of the world from them! Reward Program: 5 stars They have a reward program where you can earn points based on what you do: enter a birthday, share on Twitter, and even ordering items: You can earn 5 points for every $1 you spend! It adds up quickly and you can get money off of future orders: from $5 to $50! I have personally received the $10 off reward. Overall, I rate Royal Essence 5 stars! They seem to be a great smaller company and when you buy from them it truly matters and helps! As previously mentioned, I have ordered from them four times and will continue to use them! They are a great company! I am so glad I discovered them. They currently have their Christmas products available. They had some products for Halloween as well. I look forward to seeing what products they offer in the future. I am and will continue to be a repeat customer! I WILL be reviewing more companies with similar products. If you know of anything you want me to review let me know, and if I am interested, I may look into it. **These orders to Royal Essence were from my own money, that I purchased on my own. I was not compensated in any way for a review.